The founder of course is Jeff Bezos. The photograph and the interview highlight an attribute I greatly admire in Bezos: clarity of purpose. From the very first shareholder letter, Customer Obsession is the first priority. This simple focus requires doing three simple, but hard things. First, a founder must decide to manage a company with a particular principle. The founder must choose it, stick with it, and reiterate it over months, years and decades. Second, the founder must operate the business with that principle. The founder must infuse management meetings, guide decisions, hire a team and recommit every day to that idea. Third, the founder must exemplify the values himself or herself, and lead by example. Those three things are simple, but hard. To think through the right way to run a business - in a way that aligns the strengths of the team, the go-to-market strategy and the long term competitive advantage - takes effort. And then to lead a company that way requires relentless focus and determination. 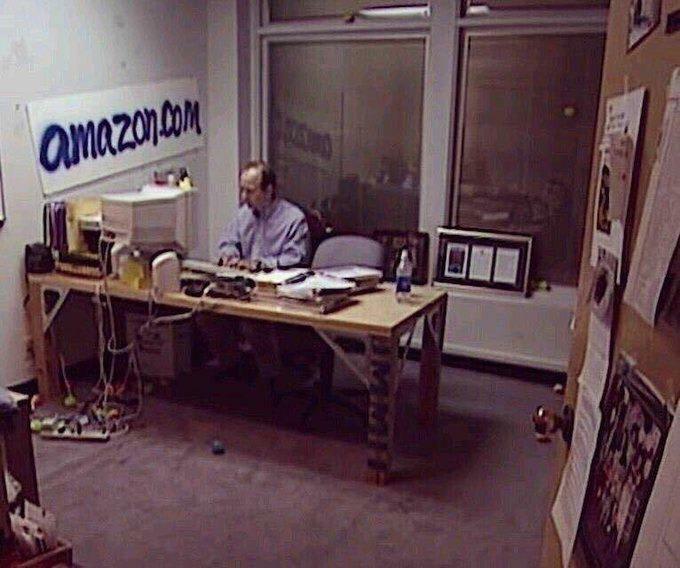 When I saw that photo of Bezos in his office, it reminded me of the dogged focus on a single idea. The desk, the Civic, the spray-painted amazon.com sign. Everything in that photo embodies that obsession. His purpose is clear.